Account: Account name set in the 'Server' setting. Rcvd: Number of received emails. Sent: Number of sent emails. Filtd: Number of filtered emails. 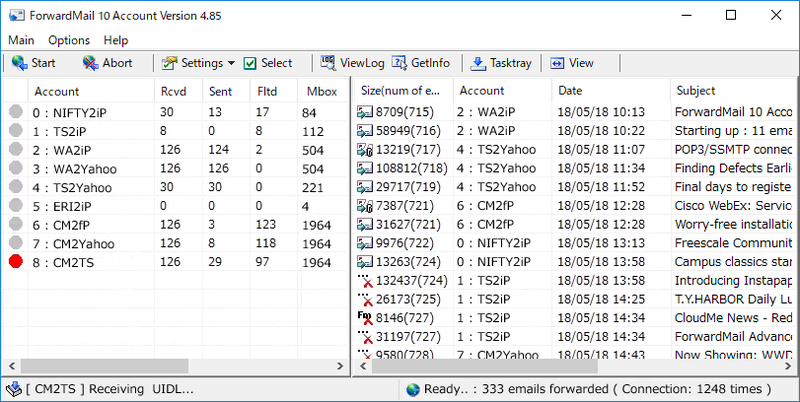 Mbox: Total number of emails in the mailbox. Timer: Auto connection interval time in minute. Fwd To: Forwarding destination address. Part Processing: The ON/OFF status of the 'Part Processing' option. Feature Phone: The ON/OFF status of the 'Feature Phone' option. The received email history for all of enabled accounts is listed on the right side of the main window. Size(num of emails): Status icon, total number of emails(bytes) in the mailbox. Date: The date information of email. Subject: The subject information of email. From: The sender (From:) address of email. To: The destination (To:) address of email. The detail log information can be shown in the dialog by clicking the right mouse button. When both Account List and Forwarding Log List are displayed, the left side window width will be adjusted automaticalｌy inaccordance with the total colum width from Account to Mbox. Connects with servers and starts forwarding. Disconnects from servers and goes to stopped state. After pressing the button, it may take time until the connection stops actually. Opens the account list dialog in which the account ON/OFF status can be changed. By clicking right mouse button on an account name, its setting dialog can be opened. Launch the separate log viewing program (FwdView.exe). Shows the detail log information of the selected log. Puts ForwardMail into tasktray, and hides its main window. Switch the main window view structures by turns.